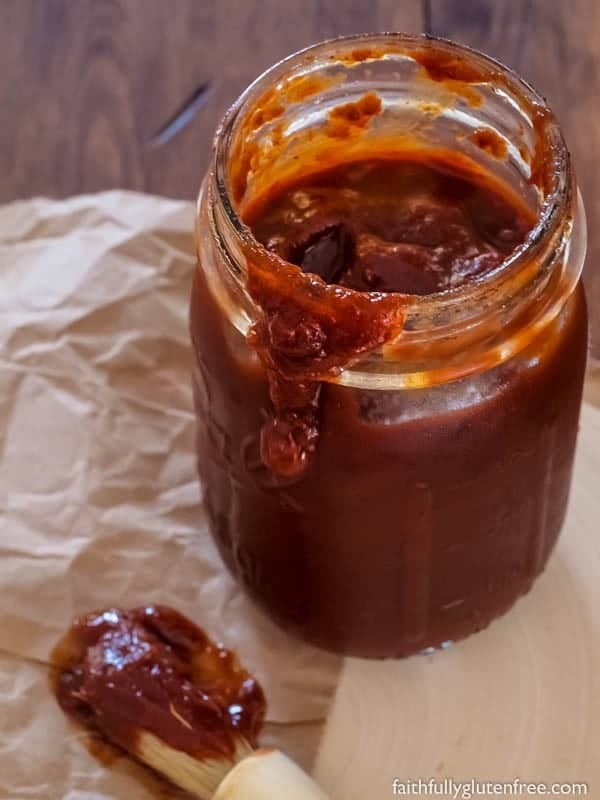 Making your own Sweet and Spicy BBQ Sauce is easy when you use your slow cooker. Cooking the sauce low and slow allows the sauce to cook down, and flavors to meld, without any sauce splattering. We’re coming up on the first long weekend of summer here in Canada. Looking at the forecast, it is going to be a beautiful weekend. Yesterday I bought my plants and seeds, and hope to get my gardens started. I usually wait until June, since we can still have snow this time of year, but I’m hoping that the snow that flew last week was the last of it. For us, long weekends also call for juicy, smoky meat. Last year I bought my husband an electric smoker for his birthday, and even all through the winter, we’ve been putting it to good use. Our favorite things to smoke so far are beef brisket, and a homemade beef summer sausage. If you have a favorite recipe that uses the smoker, please share them, I’d love to try new things. As soon as we started making brisket, we had the need for a good gluten free barbecue sauce. Although we do smother the meat with it while smoking, we also like to dip the meat into sauce while we are eating it. We bought some different kinds, our favourite being Two Fat Guys BBQ Sauce, which is free from both gluten and high fructose corn syrup. Beyond that, it also tasted great. 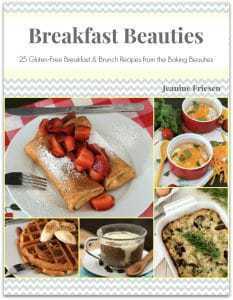 But, being the DIYers that we are, we wanted to come up with a recipe that we could easily replicate at home for less. 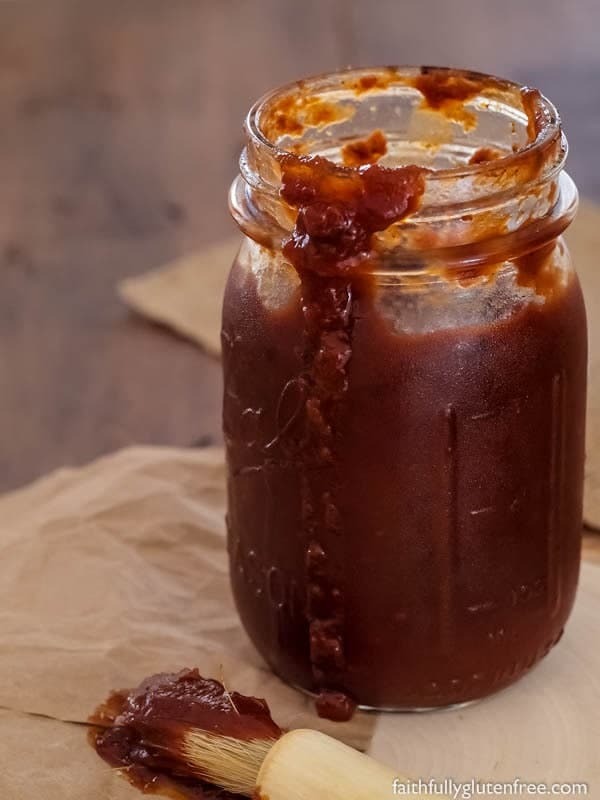 This Sweet & Spicy BBQ Sauce is the result of mashing numerous recipes together, then tweaking it some more, until I was finally happy with it. Feel free to make any substitutions or omissions you see fit – there are no rules when it comes to BBQ Sauce! I decided to make mine in a small slow cooker, because it could cook there all day, without needing a lot of tending to, and it didn’t splatter or make a mess. You can cook it on the stove top over lower heat, but I find when the sauce gets thicker, it starts to splatter, giving me a bigger mess to clean up. 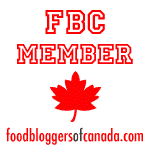 A flavourful BBQ Sauce that is great with beef, chicken, or pork. If you like more heat, add more cayenne pepper or a tablespoon or adobo sauce from chipotle peppers. Stir together all the ingredients in a 1 1/2 quart slow cooker. Reduce the temperature to low, and continue cooking for 2-4 hours, stirring occasionally. You can open the lid a crack to allow moisture to evaporate, giving you a thicker BBQ sauce. Once the sauce has reached the consistency you like, carefully spoon it into clean glass jars. I got two pint jars from one batch. I think you could sub the brown sugar with coconut sugar, honey, maple syrup, or any combination of them if you wanted to use a more natural sweetener. Whatever you end up doing to kick off summer, I hope you have a great time, and please, stay safe! This looks amazing! Is there anything I can substitute for the whiskey? I wouldn’t use it for anything else and I sure don’t want to buy a whole bottle of whiskey for just 2 tablespoons. I’m late to the party, here, but apple cider would also be a good substitute for the whiskey.